Time was, when deer would stand around and spend the time of day with you. If you had the dog on the lead, of course. If you didn’t it would just be like unleashing a small smelly wire-haired maelstrom into their calm and ordered, glassily silent world. Delighted, on many occasions, my dog would hurtle through ferns and brambles, heather and brush, blissfully unaware of any obstacle, a headless chicken of a mutt, all blurry at the edges. He wouldn’t have a hope in hell of catching one of them. He’d just get a whiff of that just-been-here-deer-musk and he would be oblivious, deaf, blind and insentient of the rest of the world. It would all go away for this one sublime moment. 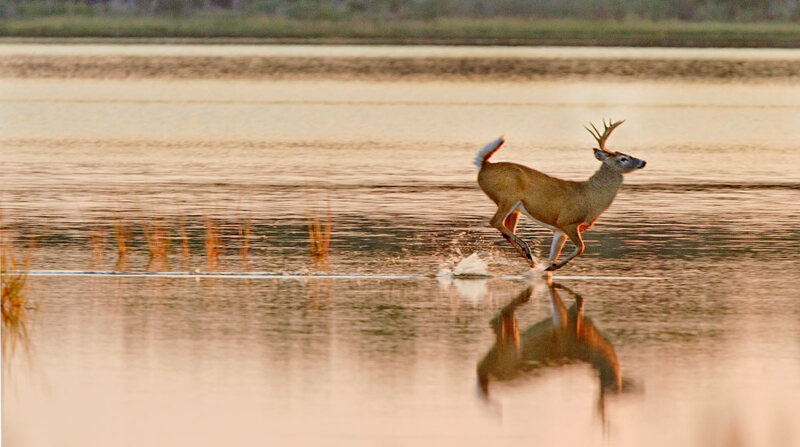 The deer, ahead, would be muttering under its breath as it bounded effortlessly ahead. Bloody dogs. You get a nice quiet meditation pose going, tree pose, balancing on three legs and synchronising breathing; you finally get to that bit where you’re at one with the cosmos and some filthy terrier comes and wrenches you away from the wheel-hub of creation and sends you hurtling off in search of an alternative meditation venue. Lately, though, we have not come upon deer doing the tree pose. Or even a salute to the sun. Because – have you noticed? – the deer all seem to be in a tearing hurry. Twice in the last week I have been walking at the side of the iron age fort in the forests behind my house, and a deer has shot out straight in front of us, and away, who knows where? I was sitting on the top floor of the Victorian mansion where I work, taking a screen break and staring out of the window on what is always a tranquil scene: a gorgeous fountain, yew hedges, lawns stretching out into the distance, you know the type of thing, when out of the woodland stage left came a large deer. He shot across the lawn like a curate late for evensong. Such haste in a deer is rare if they are not being pursued, but they are, trust me, under no pressure from such obvious external sources. They are just running everywhere. This evening we were walking across the tabletop of the fort when out shot another. I fleetingly wondered what would happen if I collided with something like that and dismissed the thought from my head hastily. The dog was with me, but bless him, his eyesight has not improved with the years. Though he is only eight, he would need spectacles to clock the deer ahead. So I waited for his nose to do the honours. Usually he is unaware of the deer until he is on top of the ground where it ran. And then he goes skittery and shoots off in lamentably belated pursuit of a deer who is, by now, part of recent history. But today he missed the trace scent of the deer completely; right until he sniffed the other side of the path where the deer had come from. Ah, splendid, his non verbal communication proclaimed. A deer. And he skittered around, choosing not one direction but many in quick succession, tracking exactly no deer at all but having a glorious time at it. I have no idea why the deer are running. It is disconcerting; but one creature will always savour every hoof-fall. And that would be the dog. Posted in Macaulay The Dog storiesTagged deer, dogs, england, forest, Macaulay, running, wildlifeBookmark the permalink. This is possible. I had a tweet from someone suggesting that it might be rutting behaviour. Apparently the foxes are all dashing about like headless chickens, too. I used to think the same about the kangaroos that hopped madly around our previous residence – if you hit one unexpectedly, you were sure to come off second best – I don’t know what I’d prefer to be hit by (neither preferably). Indeed. Unless you were protected by an anti-kangaroo force field. This still cracks me up. Fenton . . .
One of my all-time favourites, Michael. Deer were introduced here [Block Island] in mid twentieth century, and as always when someone meddles, have become a huge problem. They are everywhere, and are believed to be a main cause of the prevalence of tick-borne disease, particularly Lyme, which is a serious public health problem. They do look utterly beautiful, browsing in family groups, skittering away as the bike comes closer. They do; ours are generally shyer than those in Block Island or Richmond Park, Elspeth. We are lucky to come upon one, and an encounter is always rather magical. “Like a curate late for evensong”…priceless image, Kate! It is approaching the rut, so maybe that’s why everyone is running frantically about? It’s the biggest social mixer of the year for deer! I have a feeling you might be right. Off to collect their DJs from Moss Bross, I expect. I have often wished I could see the way dogs smell. I suspect it is rutting season, Kate. As a front window observer of deer, it is that happy time of boy meets girl. That chap was likely chasing after a doe. There have been times we’ve looked out the front window, curtainless (the better to see you, my deer) and the whole herd of doe and fawns will be congregated. Suddenly, one of the girls will start running and leaping and doing a doe dance. We know, when this happens, to scan the perimeter. Aha. There he is. Watching. Then, well, after that it goes from a PG rating to X. How wonderful that Macauley gets his fill of the deer smells . . . without the risk of actually encountering their antlers. Quite, We have muntjack here, Nancy, and I am sure you will know the damage those tusks can inflict on a dog. But they run faster than the dog could ever think. When it comes to adding my two cents about what it could mean? I have nothing for you, Kate. I’d be delighted to have them dart past me–I’d just enjoy knowing they were so close. But I wouldn’t want to think of a dog-meet-deer entanglement! My first dog, Rusty, a cocker spaniel, also couldn’t seem to get it right. He’d spot a rabbit. Once the bunny was nearly out of sight, Rusty would give chase. Too late. The bunny was long gone. Thank heavens. I think that is precisely what it is, Judy. In over 12 years of living on the edge of a reserve I’ve seen one deer one time! Maybe Deer Inc has been taken over by some new broom stag with a fitness or efficiency hang-up? Ooooh, grim. You may have something there, Col. I think that they are just messing with you. Or maybe they saw you another one of their poses, that the human eye simply can’t capture (but cameras do). Or even practicing for when the dog is loose. Lovely post. Many pictures, in less than a thousand words! Thanks Vassilis, and for coming along to read and comment! After a further few days I am convinced you are right and the deer are messing with the local dog walking population. I’ve done this chasing stuff like the dog only they were not deer – rainbows. The Abduction of the Fiddler.